↑ 50th Report of the Commission for Linguistic Minorities in India. प॰ 123. Archived from the original on 8 July 2016. https://web.archive.org/web/20160708012438/http://nclm.nic.in/shared/linkimages/NCLM50thReport.pdf. ↑ Shankar, Shiva (7 February 2018). "State flag may be a tricolour with Karnataka emblem on white". The Times of India (The Times Group). https://timesofindia.indiatimes.com/city/bengaluru/ktaka-flag-it-may-be-a-tricolour-with-state-logo-on-white/articleshow/62811158.cms. ↑ "Poem declared 'State song'". The Hindu (The Hindu Group). 11 January 2004. http://www.thehindu.com/2004/01/11/stories/2004011103410400.htm. ↑ १०.० १०.१ १०.२ १०.३ Huq, Iteshamul, सं (2015). "Introduction" (enमे). 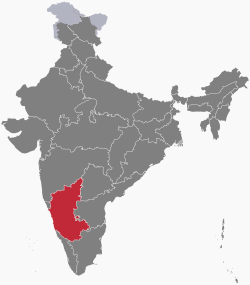 A Handbook of Karnataka (Fifth संस्करण). Karnataka Gazetteer Department. प॰ 48. http://www.karnataka.gov.in/Gazetteer/Publications/Special%20Publications/A%20Hand%20Book%20of%20Karnataka%202015/Chapter%2001%20Introduction.pdf.